Do Canadian immigrants face problems finding work with their degrees? According to the graph below, native-born Canadians make triple the average income of recent immigrants, with one third of an unemployment rate. However, almost half of the recent immigrants have a Bachelor’s degree or higher. Source: Martin Prosperity Institute, 2009. Even four years after arrival, the majority of immigrants still work lower prestige jobs compared to their education or previous job in their country of origin. Immigrants with degrees are failing to gain entry into their professions due to discrimination by employers which includes not recognizing foreign qualifications. Professor Oreopoulos of the University of Ottawa tested for discrimination against immigrants by applying to job postings online. He made up fake resumes, with “foreign” names, education and experience and a similar number with “Canadian” names, education and work experience. The Canadian resumes were three times as likely to receive an interview request than resumes that were apparently submitted by people from India, China or Pakistan. The graph below relates to Oreopoulos’ findings as it shows that immigrants reported that finding appropriate work has been their number one difficulty since immigrating. Source: Canadian Social Trends, 2008. 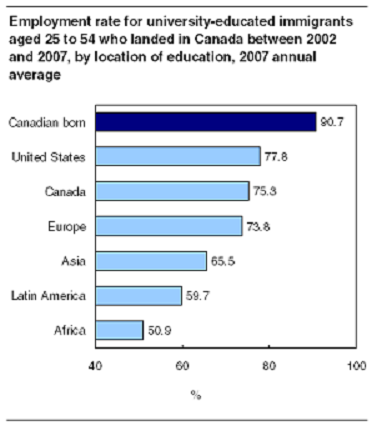 Clearly, the Canadian labour market is not welcoming for immigrants with high education. Here, it is common to see highly educated immigrants driving taxis for a living. 80% of Toronto’s taxis are driven by immigrants and half of these have at least a Bachelor’s degree. There are even hundreds of taxi drivers in Canada with doctorates.1 Even though they may have completed numerous years at a university in their country of origin, many see their only option is to complete another degree here in Canada. With a Canadian degree, immigrants greater chance at finding appropriate employment, as their Canadian education and work qualifications will be recognized and valued more than those from from their original country. The graph below shows that employment rates are much lower for university graduates from Asia, Latin America and Africa, who are considered visible minorities in Canada, than other similarly qualified Canadians. 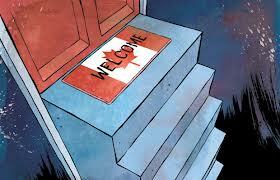 For immigrants in Canada it is a steep climb to find appropriate employment. If immigrants are allowed in Canada based on their skills, why do they fare so poorly in the labour market? Is this because of Canadians’ discriminatory practises, including things as simple as not hiring applicants with a foreign name? Whatever the answer is to these disturbing questions, it is clear why the number one thing disliked the most by immigrants about Canada is the lack of appropriate employment opportunities. 1 Citizenship and Immigration Canada, http://www.cic.gc.ca/english/resources/research/taxi/sec02.asp#s2-1, (accessed November 8, 2013). 2 A.E Challinor, Migraton Information Source, http://www.migrationinformation.org/Profiles/display.cfm?ID=853 (accessed December 4, 2013).